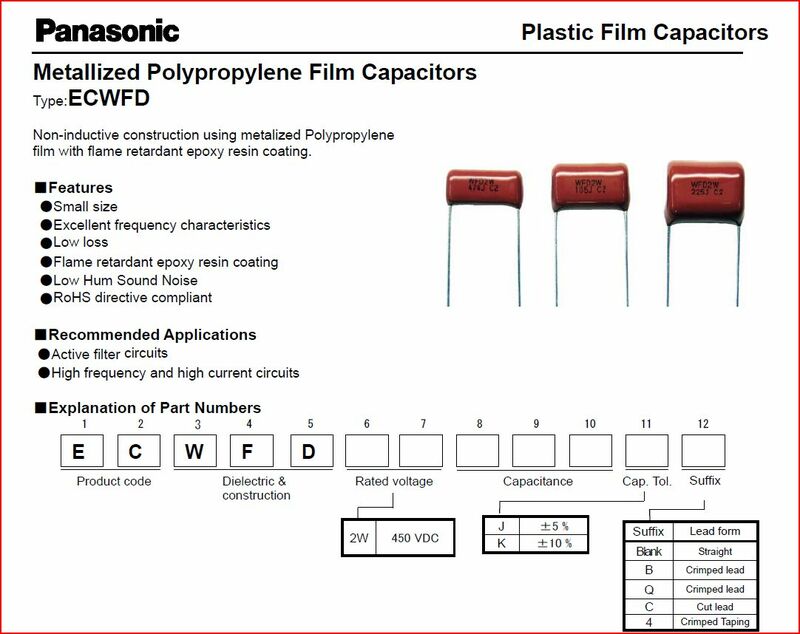 Finally, some capacitors arrived, Panasonic ECW FD type, polypropylene dielectric. These are very much suitable for any type of active filter or sample/hold circuits, thanks to their good capacitance stability, and low dielectric absorption. (1) Charge capacitor for about 10 minutes; make sure to limit charge current to a few 10s of mA. (2) Discharge for 10 seconds, using a 100 Ohm resistor. (3) Measure voltage and record maximum value (V_measured) – typically, this takes several seconds. (4) Calculate: V_measured/50 Volt *100%, the number obtained is a measure of dielectric absorption, in %. 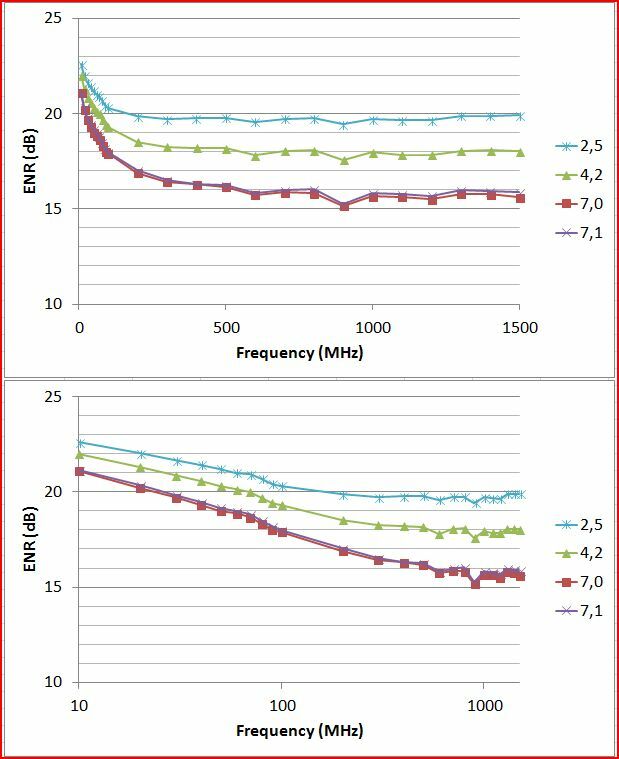 Results: 0.005% for the ECW FD (Panasonic brand, PP dielectric), and 0.09% for the original cap, HEW-446 series (TRW brand, PET dielectric). Not bad, rule of thumb says that PP has 5x lower absorption than PET, well, but don’t quote me on the numbers measured – these are just rough estimates, fair enough. Needless to say, the new capacitors will outperform the original ones by far – and hopefully last as long, or longer, 30+ years…. Another detail. 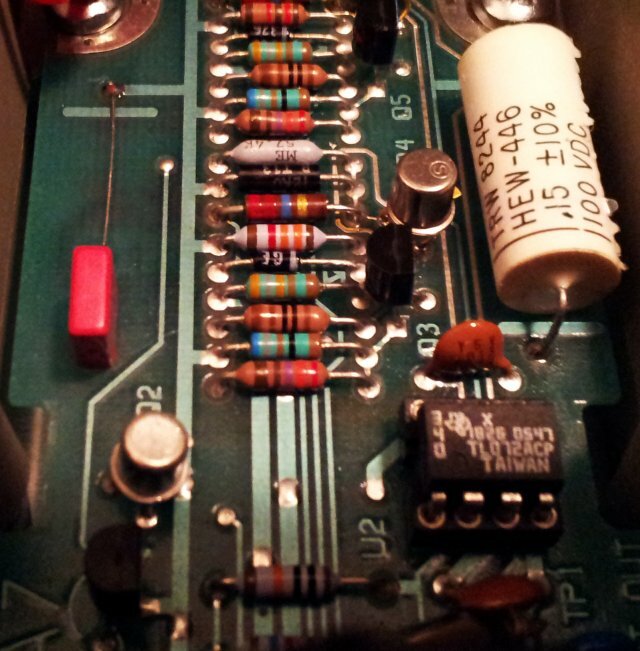 Note the line on the top side of the A7 board, close to one terminal of the capacitor? This is the outer winding of the capacitive layer. This goes to ground. 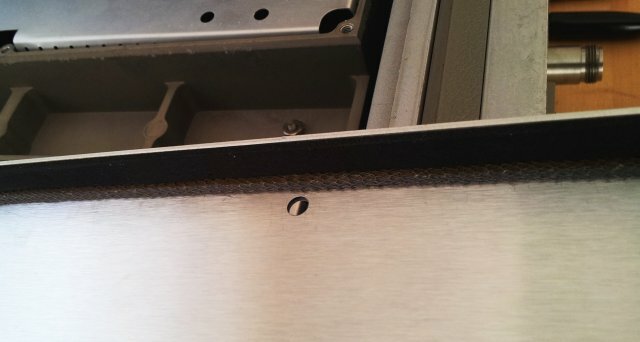 The ECW FD aren’t marked for their winding direction (these are non-polar caps, but still, there is an outer layer of foil, and an inner layer, and the outer layer does pick up more noise, and thus needs to go to the lower impedance connection). But the winding direction can easily be determined, just connect the capacitor to an oscilloscope probe, and hold the part between your fingers – then, swap the probe (switch ground and hot connection). You will see different levels of noise on the screen, mainly, 50/60 Hz hum. Select the connections for lowest noise, and the ground lead of the oscilloscope probe will then indicate the outer layer of the winding. Best, mark it with a felt pen. A broken noise figure meter, not really a good situation with so many tasks related to noise figures at hand, not only the noise source projects. So, another look at the A7 assembly. 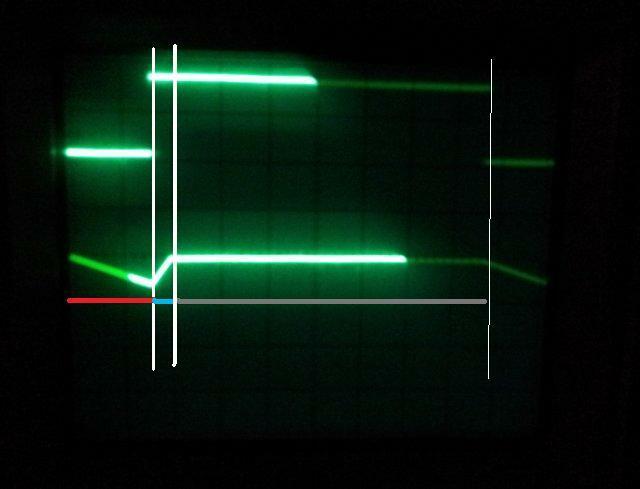 With the suspect TL072 opamp replaced by a less suitable, but known-working subsititute, the fault still comes and goes – well, maybe, in the end, the TL072 is not even at fault? There aren’t so many components around, so I checked for all the likely and unlikely things, and found – a defective integrating capacitor! 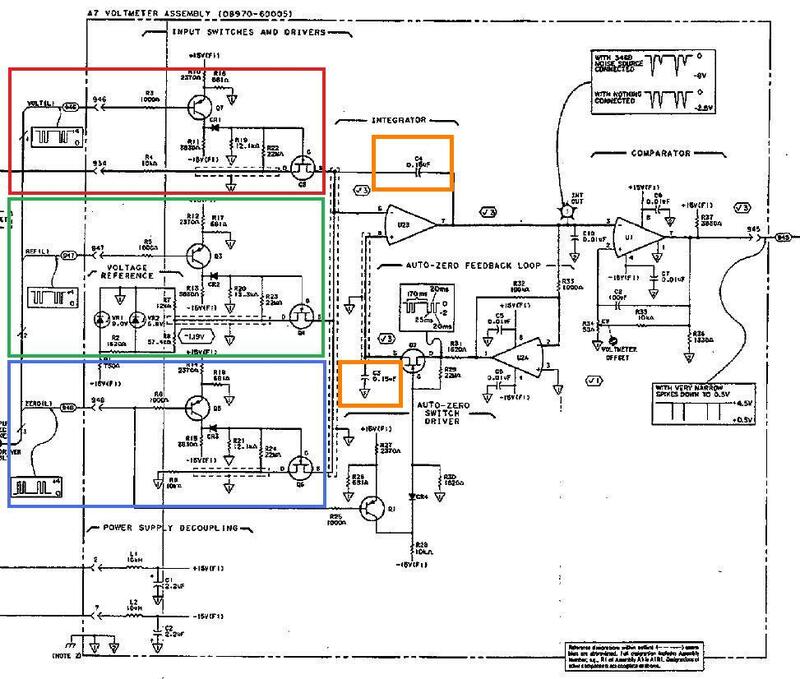 See the schematic – there are two of the same kind – C4 is the bad one (integrator cap; upper orange frame), C3 (auto-zero; lower orange frame) is fine. 0.15 µF, 100 V, Mylar, 1982 vintage, and after all these years, somehow, it has developed an intermittent fault (the first Mylar cap with such fault I have ever seen). With no spare at hand in my tiny New Jersey workshop, I decided to swap the caps, using C3 as C4, and temporary mounted a 0.1 µF film capacitor (Wima FKM) as C3. For the auto-zero function, the exact value and leakage of the capacitor won’t matter so much, anyway. See, how nicely it works: red – integrator charged from input voltage; blue – integrator discharged by reference voltage; grey – auto-zero; this sequence repeats over and and over again, and the duration of the reference segment is determined, after applying the input voltage for a fixed time (all controlled by LS TTL logic on another board). 0.25 V input, 1.2 V reference. 1.0 V input, 1.2 V reference. 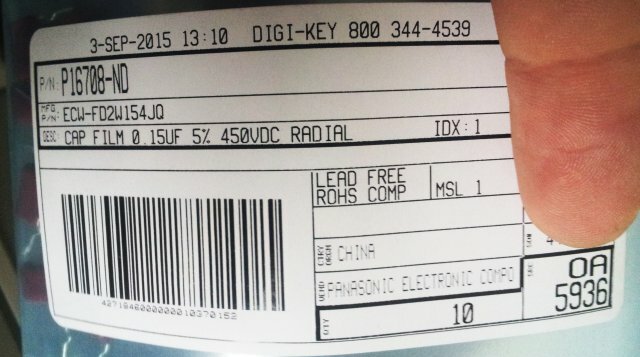 Some quick thoughts about the capacitor; typically, Mylar/PET/polyester caps aren’t the best for integrators, because of higher leakage current, and dielectric absorption, compared to, say, polypropylene caps. 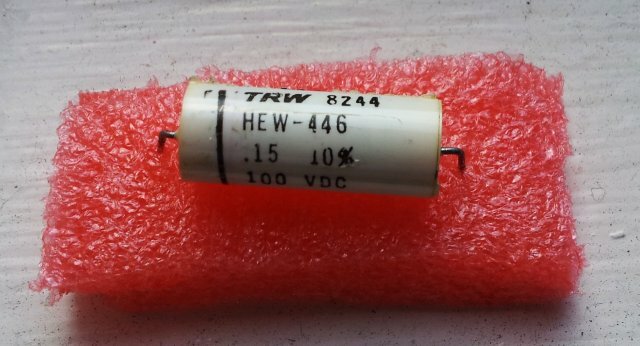 Maybe, at the time, HP engineers determined that the TL072 leakage current, and other leakage currents on the board would be much larger than any capacitor leakage current; or, they didn’t want to introduce specialized parts – these axial Mylar capacitors of TRW brand were quite common in 1970- early 1990 era HP gear. These are actually not metallized Mylar/PET, but film-foil capacitors (using discrete plastic and metal foil, similar to Wima FKS-3). 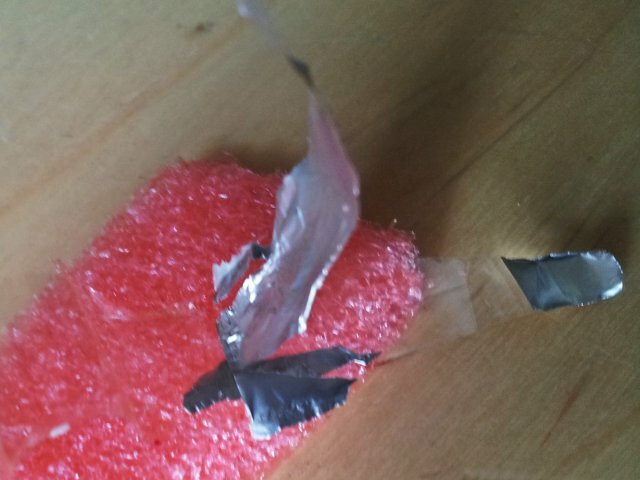 Look inside the dead cap – there actually are the plastic and metal foils. 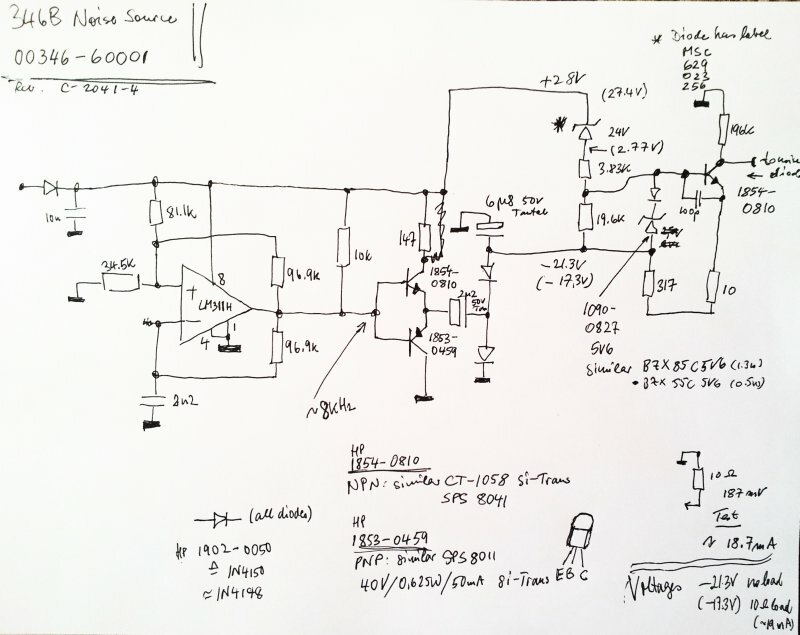 For the next few weeks, this configuration will be sufficient; then I will check capacitor stock back at the main workshop; most likely there are some Wima/Epcos/TDK FPK or MKP (PP dielectric foil-foil or metallized PP foil) capacitors around; if not, then I will just fit a pair of good Mylar caps. Not so good news today, after characterizing all kinds of noise sources, the 8970A stopped working. Can’t get it to calibrate properly, or to show any reasonable noise power values. A quick check revealed that the detector output (voltage proportional to the noise power measured) is good. But no proper display when activating the 8970A-internal volt meter (special functions 80, 81). 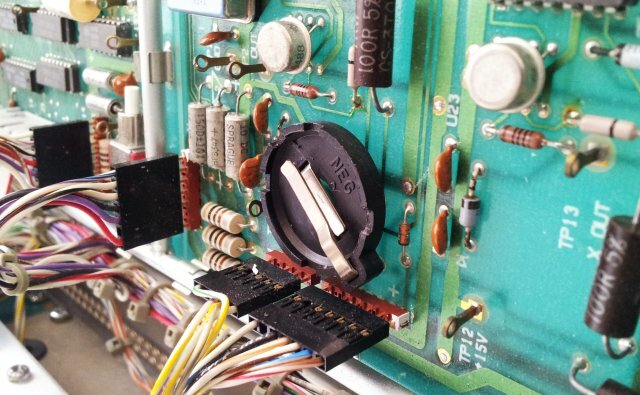 Checking various traces and signals – the issue seems to reside with the A7 assembly, voltmeter. 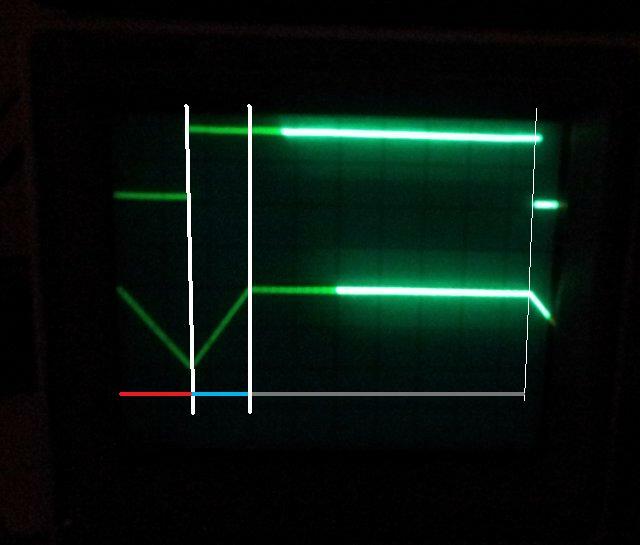 Red – input voltage section; green – reference voltage section (about 1.2 V); blue – auto-zero section. How it works, quite well-established dual-slope integration with autozero – a capacitor, initially at zero volts, is charged first from the input voltage, then from a (negative) reference voltage, until zero is reached again. The time it takes to do this directly relates to the input voltage. 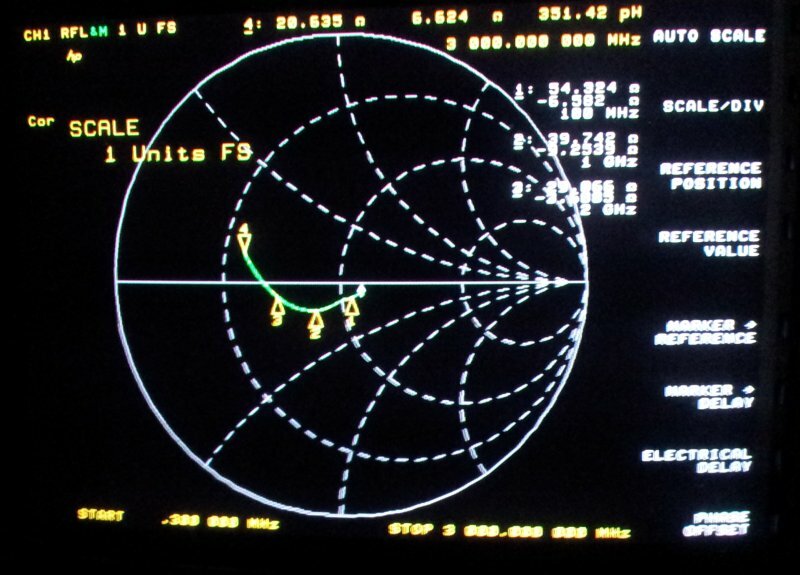 See here, working example (sorry a bit dim- see the triangular shape in the lower left hand corner of the scope screen). 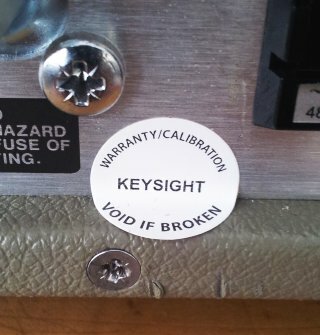 Here, non-working condition – integrator not working. After checking various FETs, and timing signals – the TL072 integrator opamp appears to be the faulty device. It is a strange, intermittent fault – not triggered by vibration, but appears to be intermittent with no direct external cause – maybe a defective output stage of the opamp? Removed it from the circuit; unfortunately, all spare back at the main workshop in Germany, but fair enough will get some TL072s in soon. …. once repair is done, noise source project will continue asap! So far, we have mainly been discussing series type noise sources, i.e., noise sources where neither anode nor cathode are connected to ground. Another common design is shown here – the shunt configuration (one port of the noise generation element grounded). The assembly, more or less just a little blob of solder with a few tiny parts inside… mostly, 0603 SMD format. The output attenuator (not shown) is a 14.5 dB(! ), 18 GHz coaxial attenuator. Don’t really see any advantage over the series variant of the noise source. But will test further. …Progress on another front, ordered a set of PCBs – they can be used for various noise source configurations. Not yet a “prototype”, but need to see what kind of GHz performance is available from such design, and how reproducible it is. No current source yet on this PCB – will add later, or on a separate board – to limit shielding to the RF section. After testing some Zener diodes and regular transistors (see earlier posts), some attempts with high frequency transistors, to generate white noise (noise power constant with frequency). 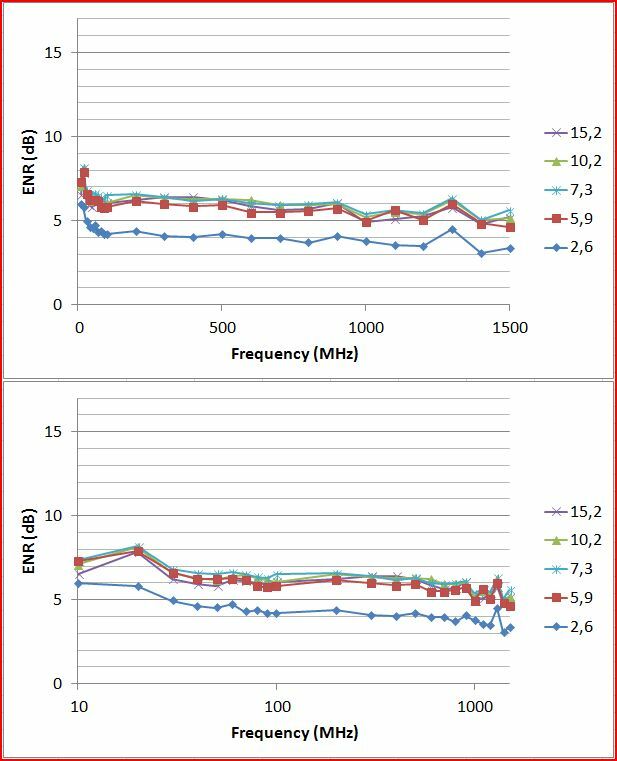 So far we have found that Zener diodes generate high noise power, and are rather flat out to 1.5+ GHz (if proper package and mounting is chosen). 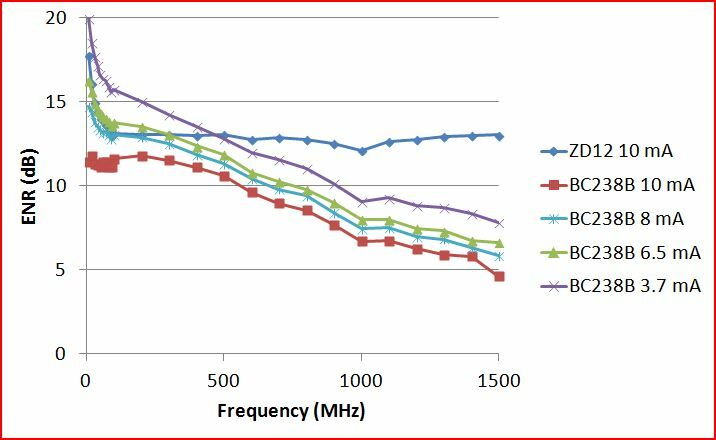 However, there is appreciable 1/f noise (increase of noise power) below 100 MHz, and this is difficult the equilize with just plain R-C networks. Another attempt, with regular tansistors – they don’t have enough noise power at high frequencies, past a few 100 MHz. Now, finally, I have received some 6 GHz BFR93A and 22 GHz BFG410W transistors, from my stock of parts back home in Germany, and have put these to the test. Same circuit is used like before, with positive current fed into the emitter, and the base grounded via some resistors (transistor is run in emitter-base breakdown condition to generate noise). 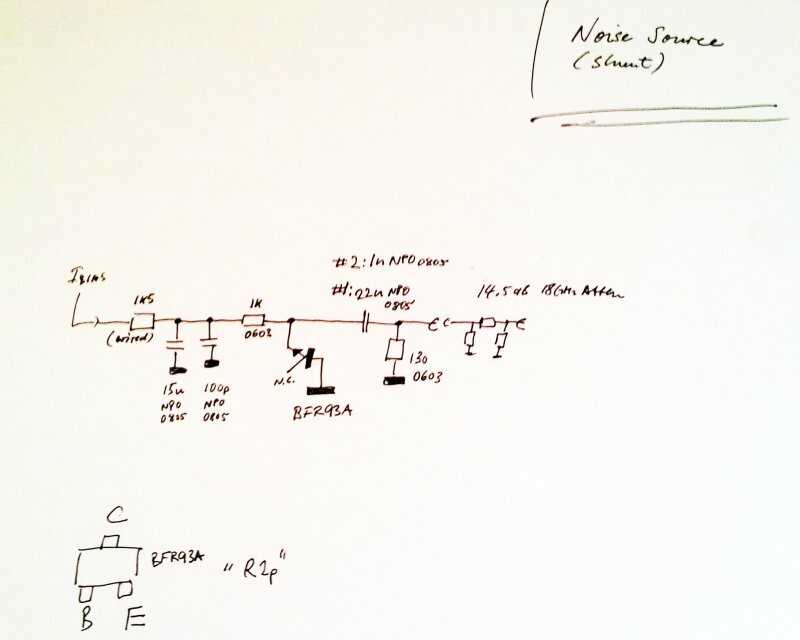 These are the parts concerned, some general notes – the BRF93A is a very useful part for all kinds of RF applications, and available at low cost. The BFG410W, it is also quite remarkable and I use it a lot for LNA (low-noise amplifier) designs – hard to beat at their cost, delivering considerable gain, at low power. Unbelievable what the semiconductor folks have been able to achieve, a 22 GHz transistor, for a few cents each! Here, the ENR results, vs. bias current, in mA. -note that the ENR increases at low bias current! As can be seen, and don’t ask me why, the BFG410W generates much less noise. Some quick change of the attenuator pad – 4 dB less attenuation. Just to check if this has any effect (besides increasing output power) – all seems well behaved and power is increased without changing any of the general characteristics. The BFG410W appears to have the best white noise characteristics so far, note that the measurements are still not too accurate, mainly for screening of parts. 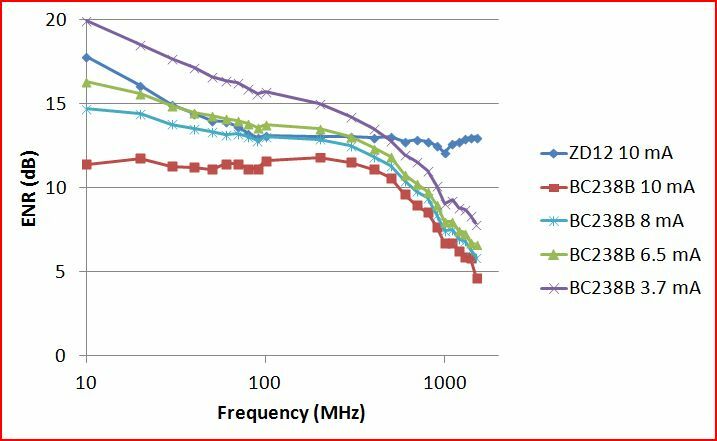 With proper bias current selection, flatness, 100 to 1000 MHz, <0.2 dB should be possible. Will do some more experimentation, and fine-tuning of the filter/equilization components; ideally, the noise power should be a bit higher, to be able to use a larger, well-matched attenuator, giving good output SWR. Also, I think it is now about time to fabricate some better HF boards (still using FR4, but precision made), to get a reproducible assembly, and to have several TWS-15N prototypes made and characterized. 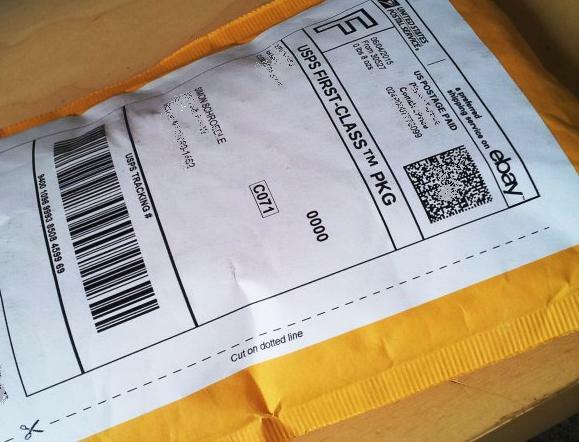 Today, a rather ordinary envelope arrived, still it feels a bit like xmas, because of the contents…. …. a HP (Agilent Keysight) 346B Noise source, with nominal 15 dB ENR. I have long been looking for one, at a reasonable price, and finally scored this unit on xbay. The calibration sticker shows good flatness, especially, in the 0.01-1 GHz region, which I need most, it is perfectly flat. Prior to having it re-calibrated, a good opportunity to look inside. There are two sections: the current source, and the RF noise source assembly (which is hermetically sealed, and you better don’t touch!). These are some close-ups of the 00346-60001 power supply and current regulator board. 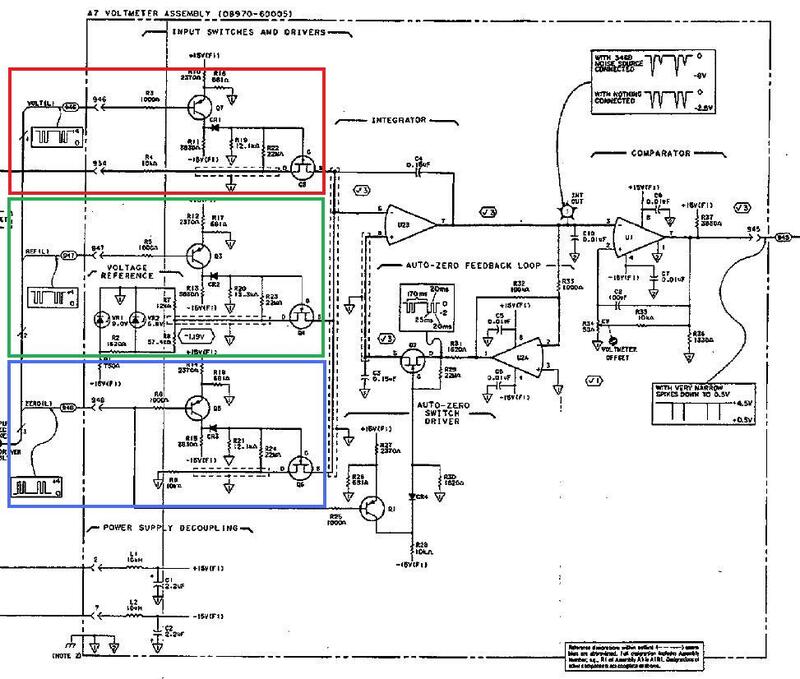 The current regulator inside of the 346B has always been a big mystery to me, because no schematic has been published by HP, in any of the service manuals. How it works, check out the schematic. The incomming 28 V (which is provided by the noise figure meter) is converted to a square wave, about 7-8 kHz, using a LM311H comparator. This is then converted to a negative voltage, about -20 V, absolute value varies a bit with loading condition. The negative voltage is then used to sink current from the noise source assembly. The current setting of my unit is about 18.7 mA, programmed by the “10 Ohm” resistor. Why the negative voltage? To simplify the design of the noise diode. 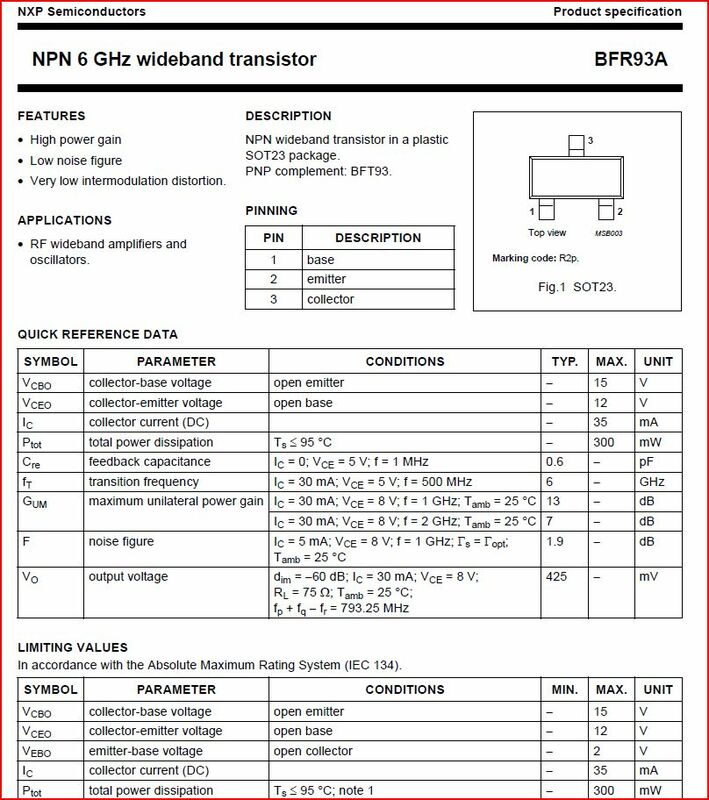 Why did HP use a 5V6 Zener for the current reference, well, this is fairly obvious, when looking at the datasheet of such diodes. Around 5.6 V, the temperature coefficient virtually vanishes (this is why such voltages are also used for voltage reference circuits). The other Zener diode, unfortunately, I was not able to identify. It has 24 V drop, fair enough, any regular Zener should to the job to keep the base bias of the output constant. For a quick burn-in, the source has now been connected to a 8970A Noise Figure Meter, and output appears to be very steady, less then 0.1 dB drift over a few hours. More noise measurements and calibration tasks to come, let me know if you need any noise sources measured, might be able to help. With the 8970A back working, what would be the first thing to do with it – well, let’s measure some gains and noise figures. 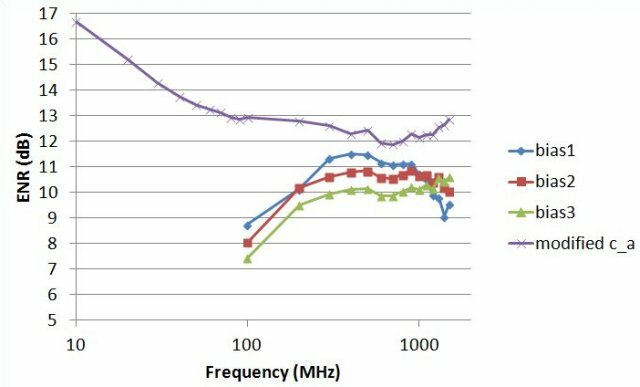 Unfortunately, the 8970A alone won’t be sufficient, because it uses a small, external noise source unit, commonly refered to as a 346A, B (or C model, if you need noise up to 26.5 GHz). 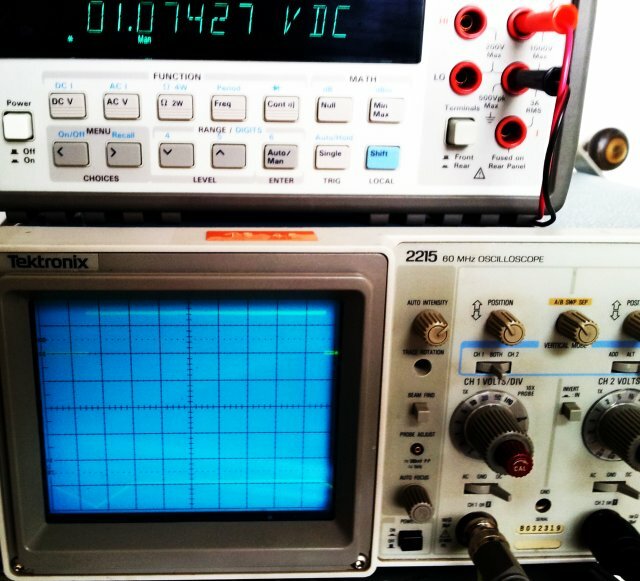 These sources are still widely used, although Keysight has introduced a new series, the N4000 series, but still the 346 models are very common, and available – this product has been around for 30+ years, not bad. The only downside – most of them seem to get lost or damaged, so they are rare on the second hand market, at least, if you don’t want to pay more then USD 0.5k for a used, out of cal, and scratched item, for a device that sells for USD 2.5k brand new. (1) The connector, preferably, get a 3.5 mm APC, then you can add a connector saver, and most of the small devices being characterized are SMA or 3.5 mm design; sure, have a few adapters at hand, or a SMA to N cable. A noise source with N connector is more sturdy, but also these connectors wear out, and aren’t all that hand except for directly connecting the noise source to the analyzer, which is not often done. 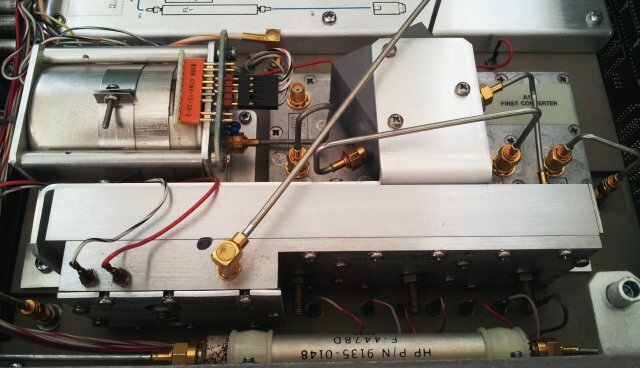 Typically, the device-under-test (DUT) is connected with some short test cables anyway, and for calibration, you just remove the DUT, rather than all the cables. (2) Flatness. The noise output needs to be so-called white noise, absolutely flat with frequency. (3) Related to flatness, very low SWR. 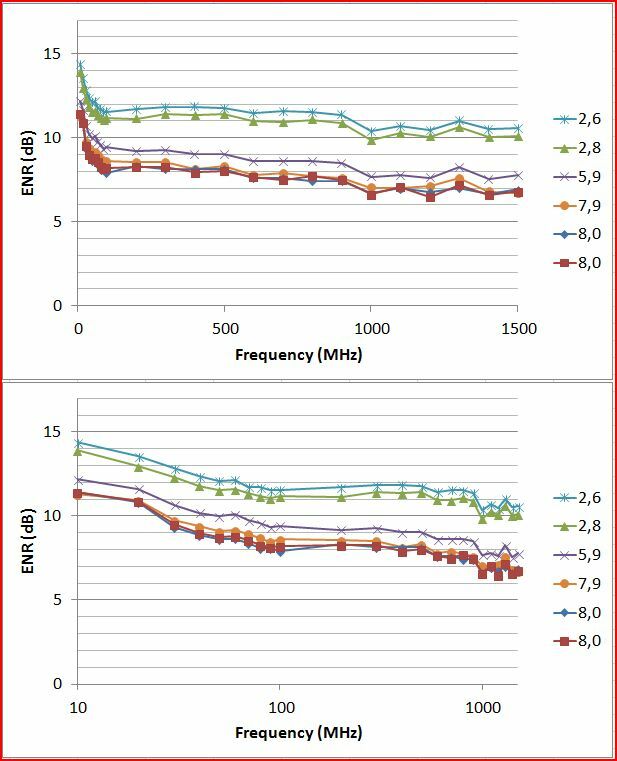 The various common DUTs, amplifier, mixers tend to have not too good SWR, so at least the noise source needs to have low SWR, otherwise, measurement errors will be enormous. Also, the SWR needs to be close, or the same, irrespective of the on or off state of the noise source. (5) The driver input, commonly, a BNC connector that is driven by a 28 V DC signal. Most sources adopt this style of input. This is one of these desirable items, in the typical used condition. Very similar device are available from Anritsu, NoiseCom, and others. The 346B has 15 ENR output, which is a good amount for general purpose application, maybe a bit too much for certain GaAs preamps, or other low level low noise applications; then you can just add a good (really low SWR) 10 dB attenuator. 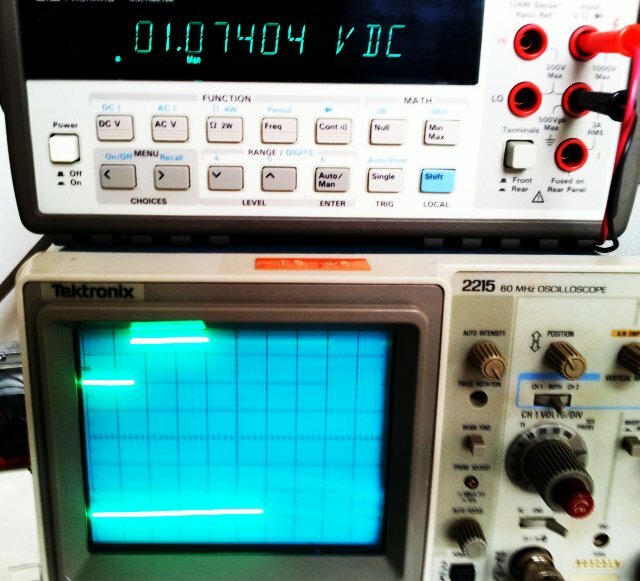 …unfortunatly, I currently don’t own any of these extremely broad-band calibrated and well-working sources, and need to deal with less fancy apparatus, but let’s at least investigate what it is all about. 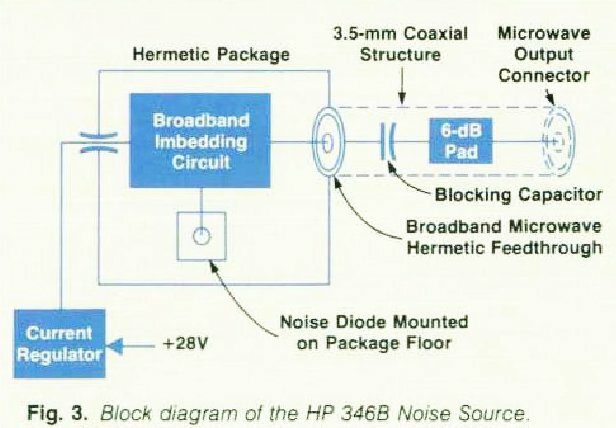 The block diagram (taken from the April 1983 issue, of the HP Journal, http://www.hpl.hp.com/hpjournal/pdfs/IssuePDFs/1983-04.pdf, shows the internal construction, still looking for a schematic of the current source, it seems to convert the positive 28 V signal, to a negative current, looking at the polarity of the noise diode. 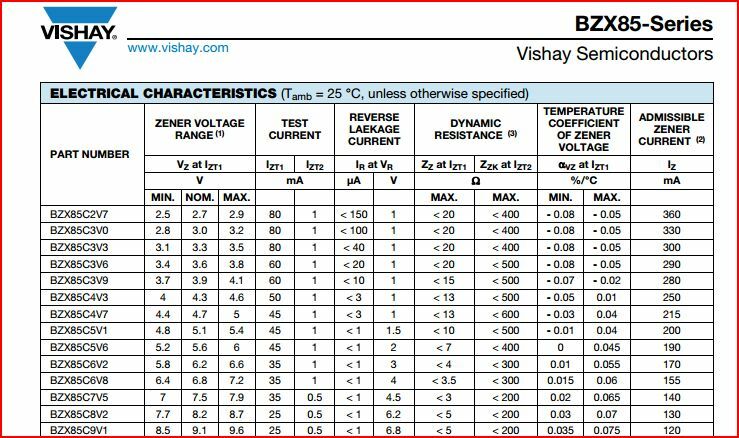 Maybe more about this later; to get proper accuracy and repeatability, it is a must to have a very constant bias current supply, on the order of 8 to 10 mA. It should provide a low noise DC current, without any large buffer caps, because the 8970A will switch it on and off periodically, to do the actual noise figure measurement. But there plenty of circuits around to accomplish this. Most interesting, the matching network. 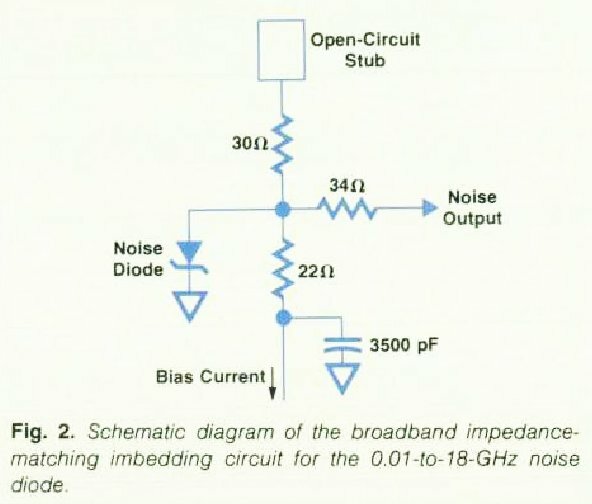 Noise diodes have about 15-30 Ohms impedance, so this all makes sense. The strange stub is one of the secrets (the major secret) that ensures the 18 GHz flat output. The 6 dB attenuator improves the output SWR and SWR change from on to off condition. In fact, it is a good idea for any noise source design to have a high quality attenuator at its output, with at least 6 dB, or a bit more. To replicate the 346B design, or at least a similar design that is good to a few GHz will remain a venture for future cold winters (good designs have been published by others but they all appear to lack flatness, and some use pretty costly noise diodes, and all need calibration that is not easily achieved unless you have access to a calibrated source). 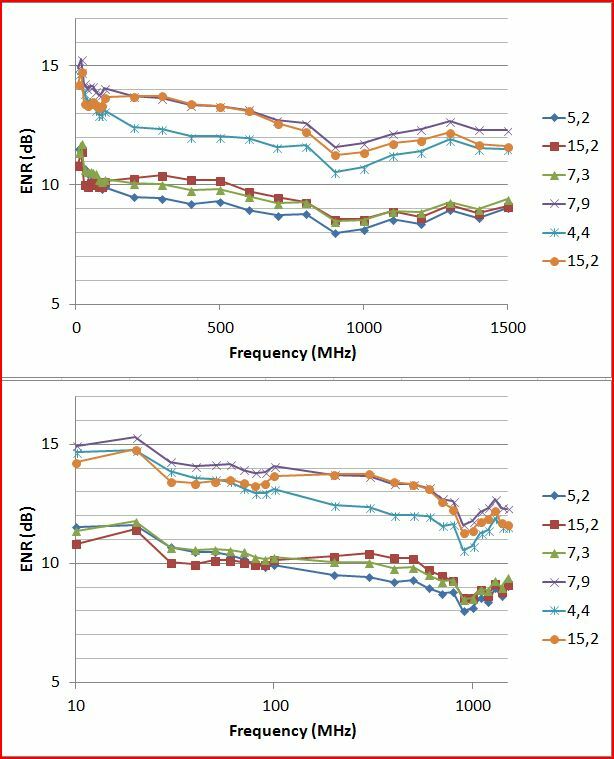 For work demanding less accuracy, many design are pretty suitable to get reasonably flat noise of the desired power, in the 10s to 100s of MHz range. This is one of the circuits that I have successfully employed. 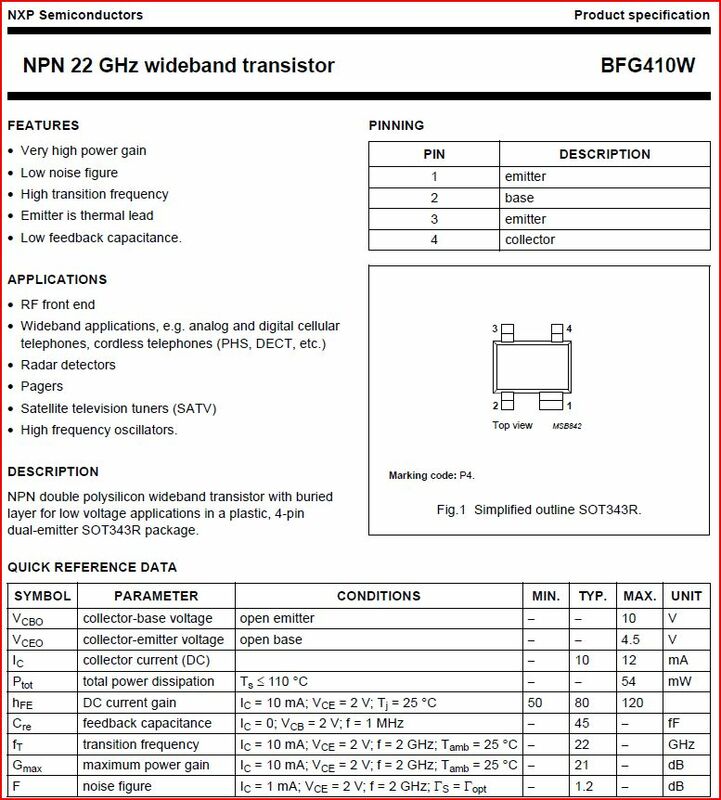 It uses the breakdown of the emitter-base diode, according to the datasheet, about 5 to 6 Volts for any common NPN transistor (minimum values, actual breakdown might not occur up to 8-10 Volts). The noise source currently in use has a BC238B transistor, because it was the first one to grabbed from the junk box. Others will work as well, including BC107, BC548, 2N2222, 2N2904, and so on. The latter two appear to have a higher breakdown voltage. Obiously, there is no bias current regulator, and the 5k6 resistor will need to be adjusted to get the right level and flatness of noise in the desired range of frequencies. 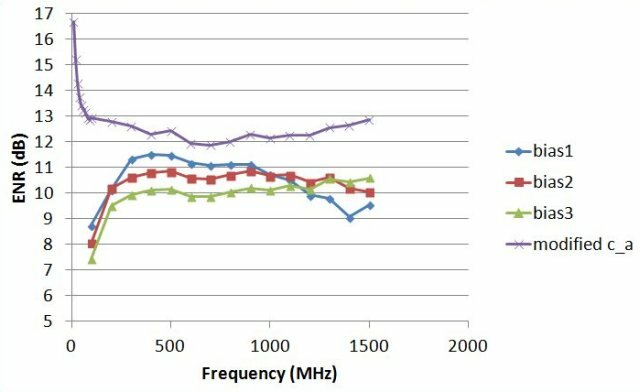 Sure, better results can result from a RF transistor like the BFR93, or other 4 GHz, or even 22 GHz type transistors – will give it a try back home in Germany because it really only makes sense in a proper RF setup, and on a small test board. 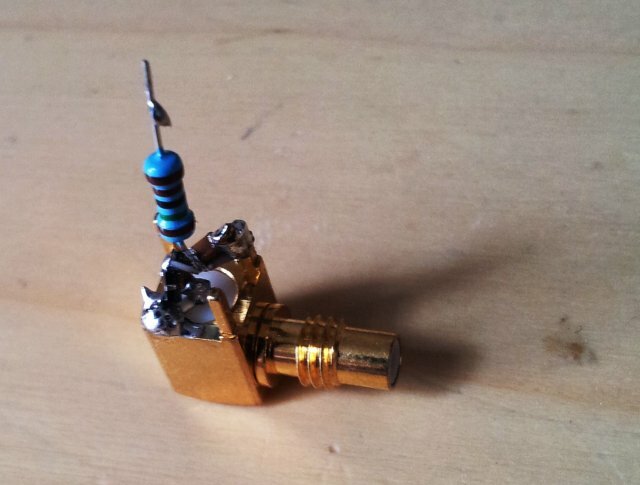 A quick test, to determine the gain and noise figure of a 6 dB attenuator. Attenuators have negative gain, equal to their attenuation value, and increase the noise figure of a system by the same magnitude. For the time being, let’s call it close enough. With the simple noise source, calibration works perfectly fine from well below 100 MHz, to above 1 GHz, making it suitable for various general purpose application. Gain and noise figure are criticial performance parameters for amplifier, mixers, and so on. In my lab, these parameters have so far been determined mostly to a qualitative (i.e., approximate) degree of accuracy, by using either general purpose equipment, or specially build test setups, for the microwave region. Such approach comes with a lot of time lost, difficulty, and lack of absolute measure. Time to improve the noise figure measurement capabilities. Which instrument to take, well, there are a few options, mainly HP 8970A/8970B and Eaton/Ailtech/Maury (the 2075 model). Remarkably, the 2075 is actually superior the 8970x units, and also had a lower list price, considering that the HP 8970x sold for about USD 10k. The downside of the 2075, and in particular the more advanced B and C models, there doesn’t seem to be any documentation around, no schematics could be found (if you have a service manual of an Eaton 2075B, or Maury 2075C, please let me know); for the HP 8970A, full manuals and several application notes are around. As luck would have it, I recently found a unit on xbay, a 8970A, non-working condition, error E26. 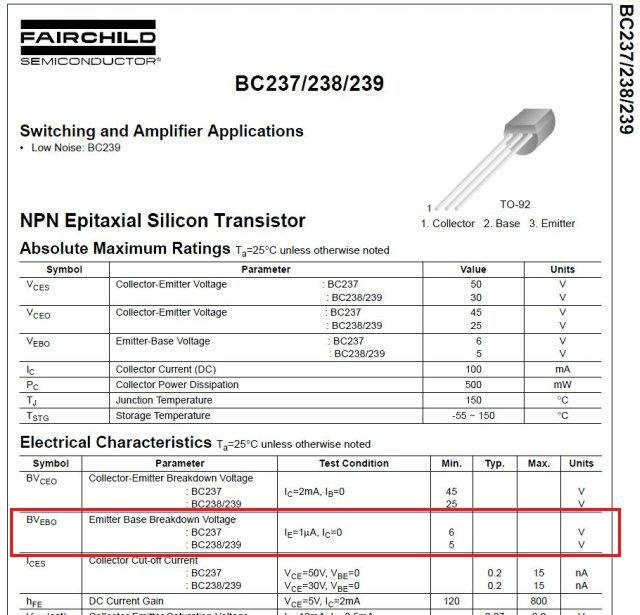 This error indicated that the IF attentuator calibration has been lost, typically, it is associated with a low battery of the non-volatile memory. Note the Keysight cal seal – the first one I have ever seen. To proceed with repair, this will be the first thing to be removed. Never mind! 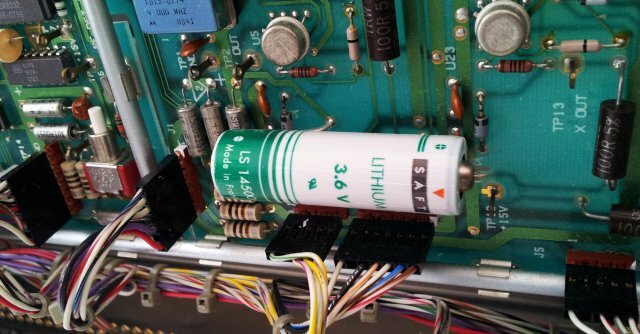 There are multiple versions of the 8970A controller boards, earlier boards use a 3.6 V NiCd rechargeable battery, but these tend to leak, and are now no longer available. The unit I am dealing with has a more recent control boards, using a BR2325 Lithium cell (3.0 V). Rather than dealing with BR2325 cells, decision was made to replace it with a more permanent solution, which might last 10 years, or longer. 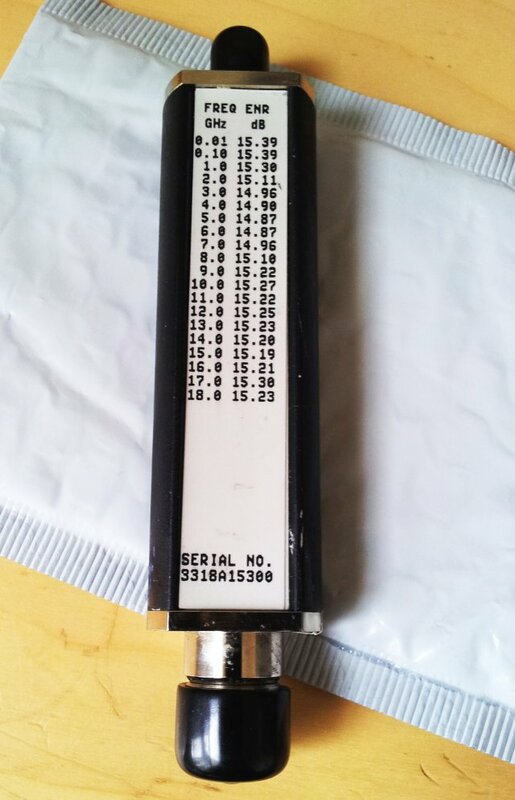 A 3.6 V Li-SOCl2 cell, of prime quality, SAFT, Made in France. These cells are of excellent quality, and have very small self discharge. This is the battery, with some (transparent) heat shrink tubing around the leads. …a few minutes later, the battery fitted to the board. Note the “BR” rather than “CR” coin cell! 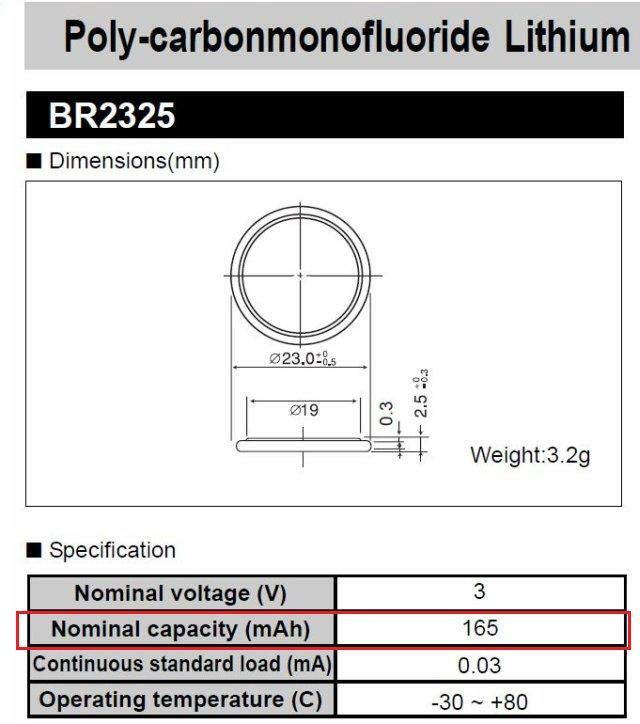 CR uses Mn-oxide (MnO2) vs Li, whereas the BR type is using a carbonmonofluoride compound, it typically has lower capacity but better long-term performance, which is important for memory back-up applications, where self-dicharge is often more limiting than actual current drain. 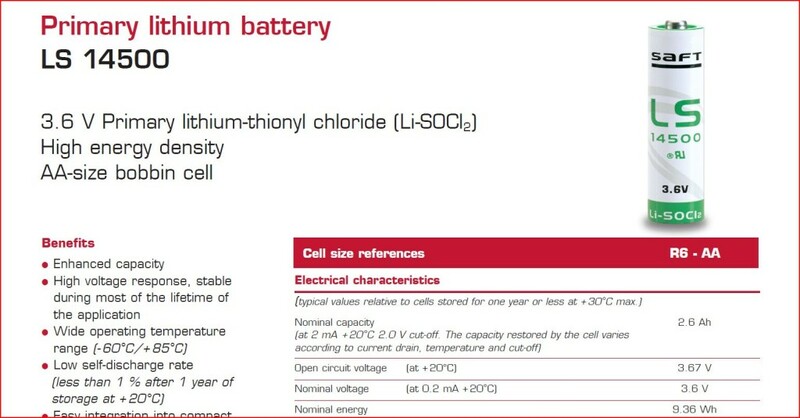 The new cell has 2.6 Ah capacity, 15 times more than the coin cell! Having the battery replaced, now the tricky part. 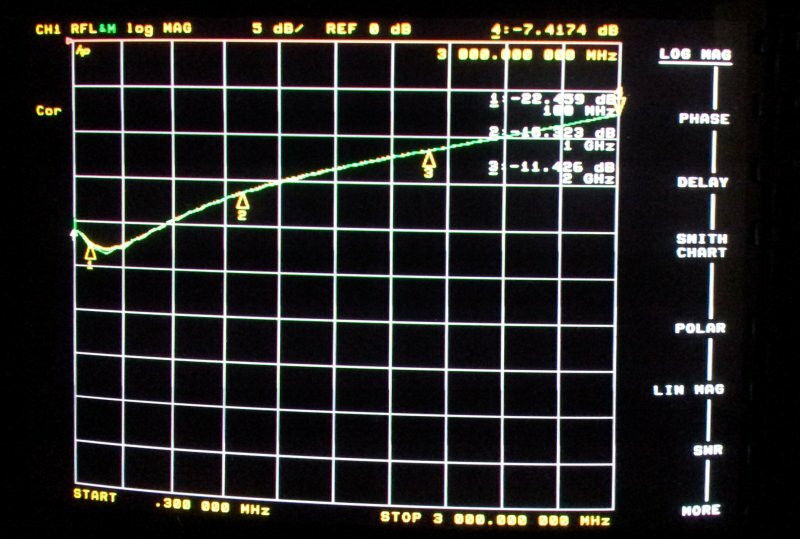 The actual attenuator calibration, to get the proper cal coefficients back into the 8970A. The calibration itself is just a matter of 1 or 2 seconds (initiated by special function SP 33.0), however, it requires a 346B noise source, with 15 ENR output, unfortunately, I don’t own any of these wonderfully noisy things. Well, there is a work-around. Just push the green PRESET button, and connect a 30 MHz generator (adjustable down to -100 dBm) to the 8970A. 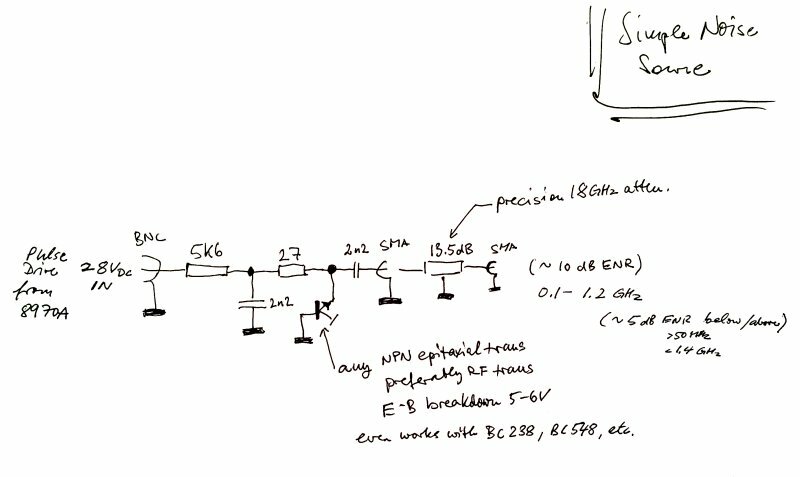 Then, we need to adjust power to approximately equal 15 ENR in a 4 MHz bandwidth, the bandwidth of the 8970A. 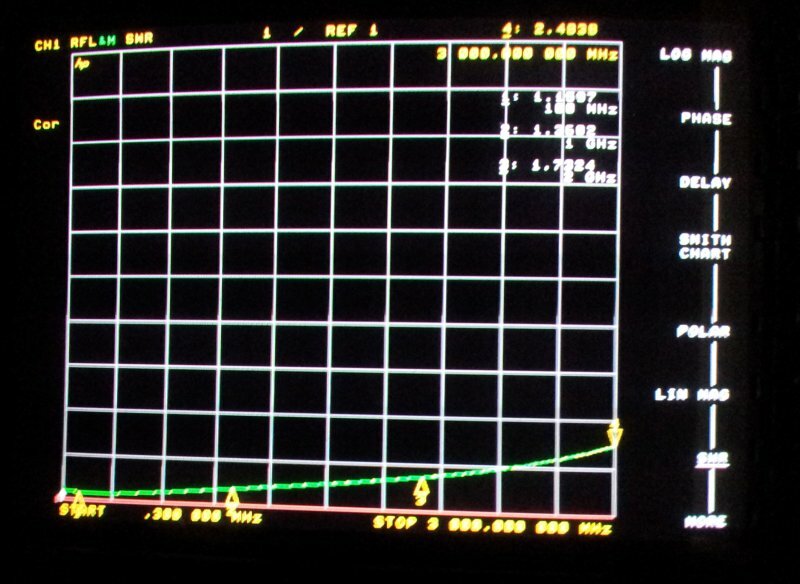 15 ENR, that’s about 174 dBm/Hz+15 dB+10*log(4 MHz)=-93 dBm on the 30 MHz generator, to get the same total power into the 8970A detector, roughly. Using special function SP 9.2, the 8970A can actually measure absolute noise power, and the generator can be adjusted to result in a reading of about 15-16 dB (which is dB above a -174 dBm/Hz noise floor). Adjusted the generator to -95.5 dBm, which gave just about 15 dB. Then, execute SP 33.0 to calibrate the attenuators, and all should be fine. In fact, it worked, and the unit is back alive. The inner construction, it is a thing a beauty, and a pleasure to the eye. 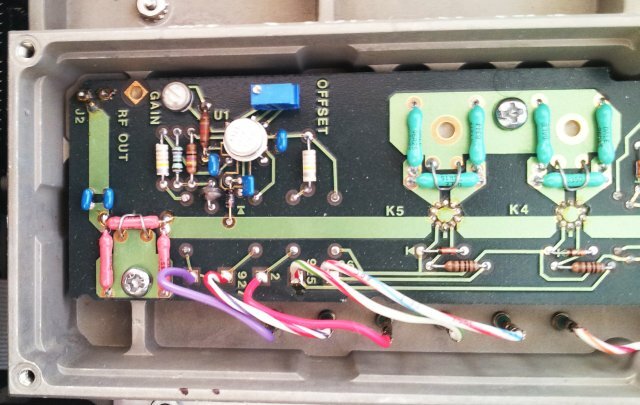 Note the wire above the input section resistor – is this for adjusting their parasitic properties? 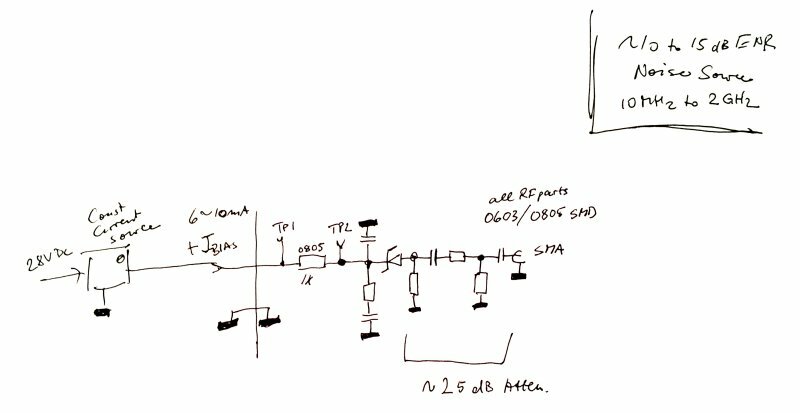 This I will need to put to a test later, using a few resistors, and measuring the SWR of such PI-type attenuators, with and without wires…. 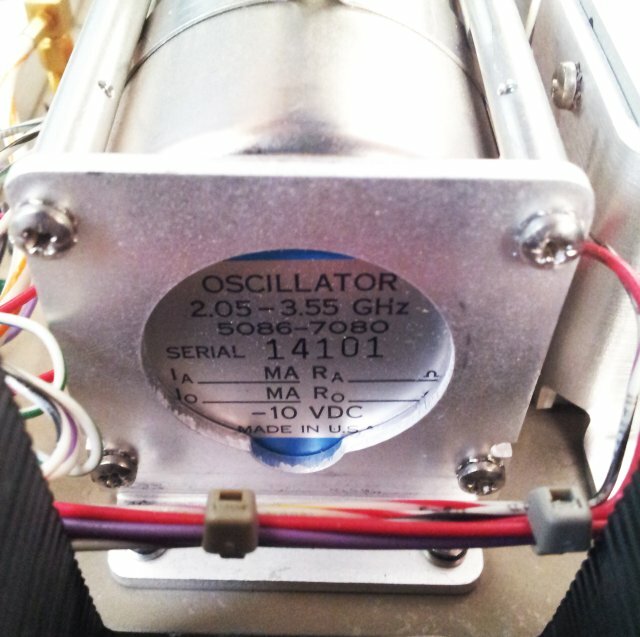 The 1st LO, a YIG oscillator. 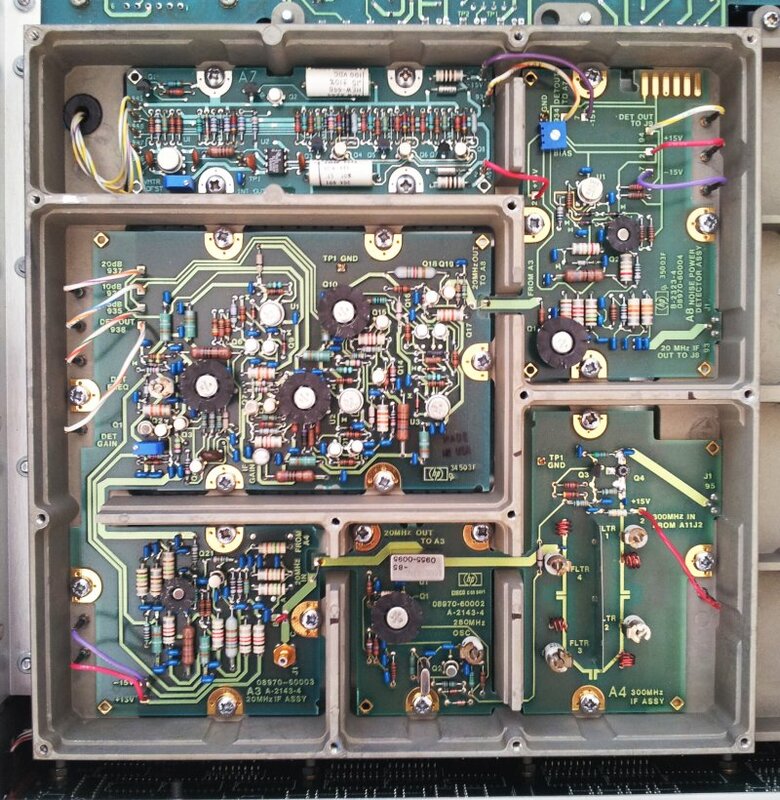 The same as used in the 8558B spectrum analyzer! … the 2nd converter is idential, or nearly (fully?) 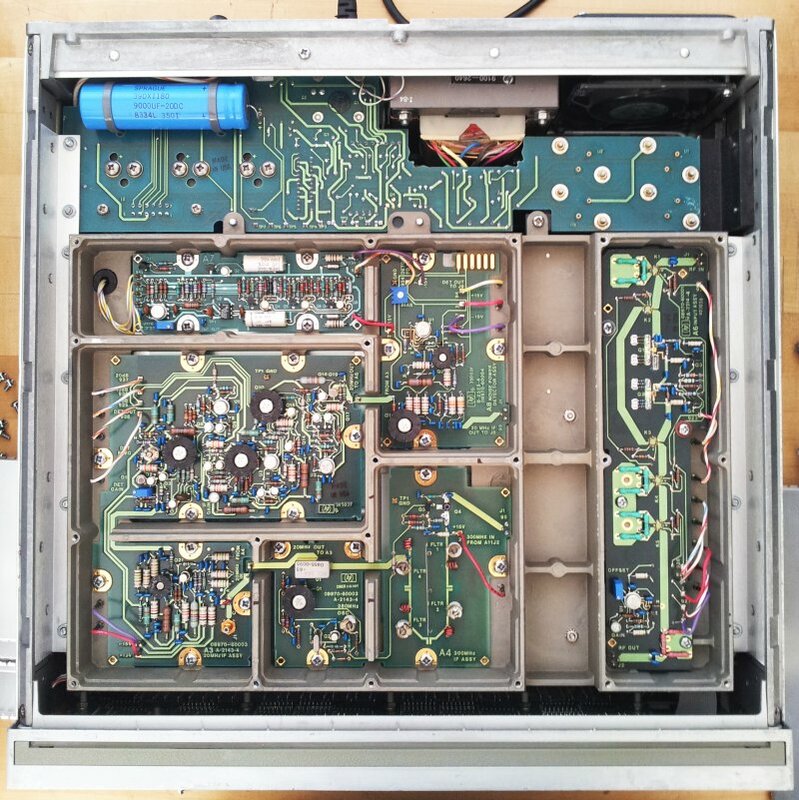 identical to the 2nd converter of th 8565A, 8569A, 8569B spectrum analyzer units (P/N 08565-60216, the A35 assembly of these analyzers). Another example of HP cleverly re-using some of their most ingenious designs. The shielding of the 8970A assemblies, this seems to have been developed for the 8970 series exclusively, a cast aluminum body, separate, spring-contacted aluminum covers, and a more rugged overall cover with an elastomer/metal mesh seal in the corners to prevent any of the waves from escaping, and to ensure that no spurious signals are getting into the chain of modules. In the end, this is a highly sensitive receiver, working at the thermal noise level. So we don’t want any high-level radio stations radiating into there.